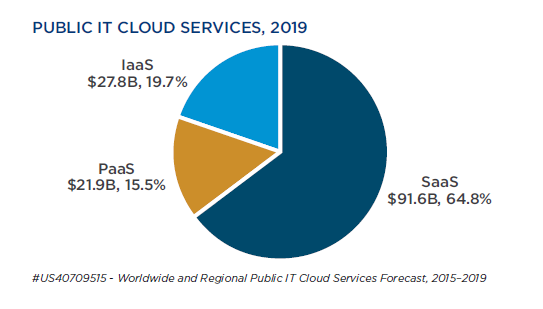 The worldwide public IT cloud services revenue (SaaS, PaaS and IaaS) will reach $141.2 billion by 2019 according to IDC’s forecasts. While SaaS makes up most spending, PaaS and IaaS are expected to grow at almost twice the rate of SaaS by 2019. IDC predicts that “Greater Cloud Spending” will exceed $500B by 2020. The spending includes SaaS, PaaS and IaaS, plus all the professional and managed services of cloud technology (public and private), and software and hardware that support cloud implementation. With the growing demand for cloud services and a strong belief that cloud is a core, Microsoft created the Cloud Solution Provider program (CSP Direct) to help its partners move their customers to the cloud, and build value by providing them with the level of the support they require in the cloud adoption. Finally IT cloud solution providers have the power to build the best possible cloud experience for their customers that comes from one source. Cloud solution providers can now integrate their own cloud products and services with the full suite of familiar Microsoft products in the cloud under only one billing system for all. Improved levels of administrator and user support. Have full access to Admin portal to decide how much control you want and what you want your provider to control or support. Saves your IT department time in designing, planning and deploying components. By leveraging the expertise of a CSP partner and having all deployment processes managed by the provider you will save time that can be allocated in more strategic business initiatives. Visibility and guidance. Work with your favourite CSP partner who may already know and understand your business and who ensures that you won’t be charged for a service which you don’t require. Codec-dss, a trusted Microsoft Gold partner, are now the largest Cloud Solution Provider (CSP) in Ireland. This means that customers can now benefit from the direct provision, management, support and billing for the complete Microsoft Cloud portfolio including the Office 365 suite. Find out how we will save you money on your current Microsoft licensing while at the same time give you greater flexibility on your payment options. We also take away the headache of administering your cloud licensing – clients have the comfort of knowing they are working with a trusted Microsoft partner. Get in touch today and find out how much we can save you.